Just a few days ago, we got the deadly ‘blue ticks’ on WhatsApp which is more dangerous that ‘last seen’. Wanna get rid of it? Here is a simple trick. Just a few days ago WhatsApp introduced the ‘blue ticks’ which tell you when your messages have been read. Now, people have got into trouble, in their relationship, in their personal or professional life when they can’t be online or reply during all times in a day. And people need a solution to get rid of this new feature, I guess people hate this new feature of WhatsApp than any new feature introduced in any messaging app till date. And we have a solution for you. But before that let’s have a look once again what the ticks means on WhatsApp. So, just one tick means that your message has been delivered to WhatsApp server, while when you get two ticks the message has been delivered to the person you just sent the message and the double blue ticks means that the person has read your message. 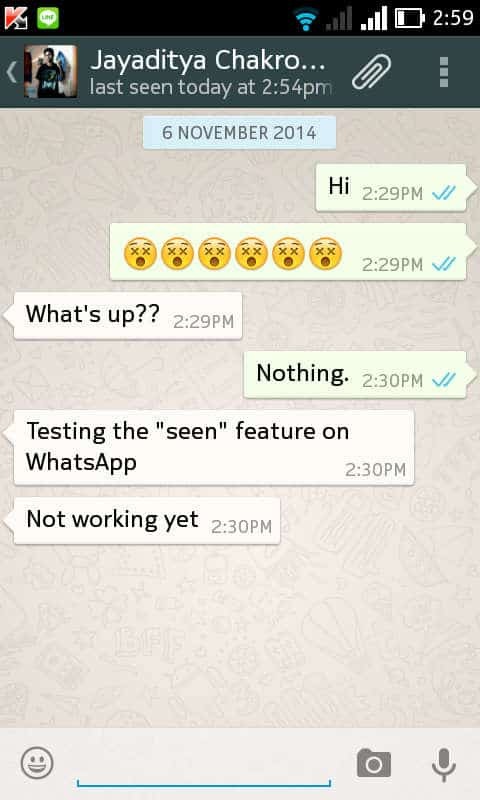 So, here is how to avoid this and get rid of this weird and sometimes ‘irritating’ feature of WhatsApp. Just follow the steps below and everything should work fine. When you receive a WhatsApp message while you’re online or on your lock screen, don’t open immediately. Let your friend know that the message has been delivered. That’s all, using this trick you can get rid of this feature and just go on well, without hurting anyone or doing anything that will ruin your relationship. This has worked on Android smartphone, but I hope that I will try with my Windows Phone as well, as currently I am using Nokia Lumia 520, Opps, it is Microsoft Lumia now. But til then, you can be sure that this simple trick will work fine. Meanwhile, I will be also busy bringing up the latest news about the Microsoft Lumia 535, which will be the first Microsoft branded Lumia. Till then, happy WhatsApping and happy ignoring. If you find this trick working on other devices, please let us know so that we can update and if possible, send us your screenshots, we will try to get back to you as soon as possible. Previous articleGet Ready! OnePlus One’s second pre-order is set to go live on November 17.